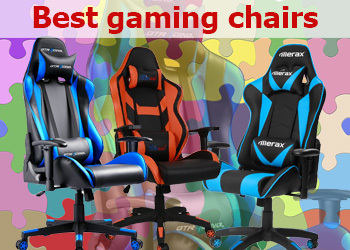 Even though most gamers focus on only getting the best gaming consoles and PCs, gaming chairs, and in fact, only the best gaming chairs contribute to the overall gaming experience. No matter how good you are at your thing, comfort is fundamental. If you have back problems or you are an avid gamer who is always on your gamepad, you need to consider buying a specially made chair for gaming. Also known as wheelbase chairs, PC gaming chairs are basically chairs with a sturdy back support, armrests, caster wheels, and adjustments. Besides gaming, these chairs can also be used as office chairs and study chairs. In this review of the best gaming chairs, we are going to focus on the top 10 best PC gaming chairs that gamers should have on their wish list. We first came up with a shortlist of over 20 gaming chairs and finally narrowed down the list to 10. In coming up with this review, we carefully factored in features, comfort and most importantly, value for money. So, without wasting more time, here is a review of the top 10 best gaming chairs in the market. Since its introduction to the market, the Homall Executive Swivel Gaming Chair has steadily climbed the ranks and is currently a bestseller on Amazon and other top retailers in the category of best-selling PC gaming chairs. What makes this chair a success is its versatility and affordability. Besides, it offers maximum comfort even when gaming for long hours. Here are reasons why we liked the Homall Executive Swivel Gaming Chair as well as areas where we think it underscores. 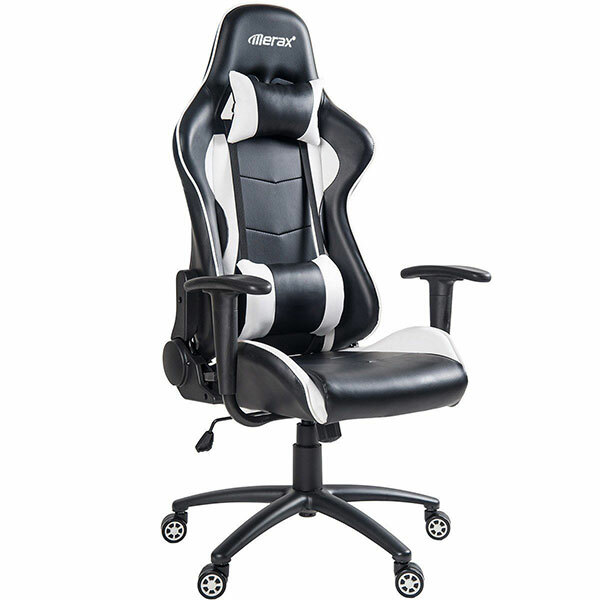 Versatility – Even though it is a preferred choice for gamers, this chair can also be used as an executive office chair as well as a study chair. Strong and Sturdy – This gaming chair has been built using the best high-grade materials and this is evident from the 300 lbs. payload limit. Affordable – The range of superior features and the around $100 price tag, the Homall Executive Swivel Gaming Chair is real value for money. Easy Assembly – Itself, it is very easy to assemble and furthermore, Homall included very detailed assembly manual. No Armrest Adjustment – Homall should have included armrest adjustment for them to be fully functional for all players; both big and small-bodied gamers. The Homall Executive Swivel Gaming Chair boasts a sleek and stylish design that will always add aesthetic value to any gaming room, study or even office. Orthopedically designed, it has been built with select high-grade materials that give it the weight it deserves to support the 300 lbs. maximum load capacity. This gaming chair has 90 – 180-degrees tilt lock that gives it an impressive multi-functionality. You can lock it in a steady upright gaming position, rocking angle and even an almost 180 degrees resting angle. To accommodate different heights, Homall included a gas spring cylinder height adjuster that reflexes with the slightest push. All the weight is evenly distributed on the floor with the 5 caster wheels connected to a 360-degrees swivel. The outer PU leather cover has been neatly sewn to snugly hug the adjustable lumbar support, back body, and headrest. On the downside, Homall ought to have made the armrests adjustable just like the headrest. It might actually be uncomfortable for small kids when playing because the armrests are just below their shoulders. However, this is, in turn, a great thing for taller gamers. These armrests are spacious and accommodating for better elbow balance and consequently, gaming pad handling and ergonomics. The Homall Executive Swivel Gaming Chair is excellent for gamers who have back problems as well as those who play for long hours. Take advantage of the pocket-friendly price and buy the Homall Executive Swivel Gaming Chair which is available in several color options. For those looking for a gaming chair to start with, then the BestOffice OC-RC39 will be a great place to start at. It is among the best gaming chairs that you will get at less than $70. Unfortunately, this seat has a 250 lbs. weight limit which is quite low for a gaming chair. However, in terms of comfort, versatility, and durability, it is quite impressive for an under $70 gaming chair. Here are some of its great features as well as weaknesses. Very Versatile – This gaming chair has a very wide application and can be used for gaming as well as an office and study chair. Pocket-Friendly – If you are on a budget, you can get this gaming chair now without breaking the bank. Low Weight Limit – The 250 lbs. weight limit is low compared to the average gaming chair weight limit of 300 lbs. Not Comfortable – It is not very comfortable in the first weeks of use because the seat cushion is very hard. The BestOffice OC-RC39, just like all other BestOffice gaming chairs has a strong, sturdy and durable construction. This chair can accommodate up to 250 lbs. which should have been improved a little bit so as not to limit anyone from buying this cheap gaming chair. This chair has no recliner but can at least be tilted a little bit to an angle of around 120 degrees. There is a tilt lock knob underneath the seat to fully lock it into position for steadiness. The BestOffice OC-RC39has a strong center pole with 360 degrees swiveling and a gas spring height adjustment which glides up and down slowly unlike many other chairs that jerk up and down. The BestOffice OC-RC39 sports a sleek and elegant design that is very easy and straightforward to assemble. It has been finished with high-quality PU material that is easy to clean and very durable. The high-back and ergonomic back design fully support your entire back and spine column while the headrest supports the spine and neck. On the other hand, the armrests are very strong and padded even though they are not adjustable. One problem with this chair is that the seat cushion is very rigid and during the first weeks of use, it is quite hard and uncomfortable but as you get along, it becomes soft and more comfortable. The BestOffice OC-RC39 New High-Back Racing Car Style Bucket Gaming Seat can be a great addition to any avid gamer’s collection. It is comfortable, versatile and very durable. If you are looking for an entry-level pro gaming chair, then this chair will be your best shot as it is very affordable. The GTRacing Swivel Rocker E-Sports Gaming Chair is an aesthetic and comfortable chair that is predominantly used in gaming. However, it can also serve as a great office and study room chair. This gaming chair has been built to offer stability and comfort when enjoying your games. Available in 3 color options, the GTRacing Swivel Rocker E-Sports Gaming Chair is among the best gaming chairs you can find under $150. Here is a review of this great gaming chair from GTRacing but first, its pros and cons. Strong and Sturdy – This gaming chair has been crafted with strong and durable materials that give it the sturdiness to support the 330 lbs. payload. 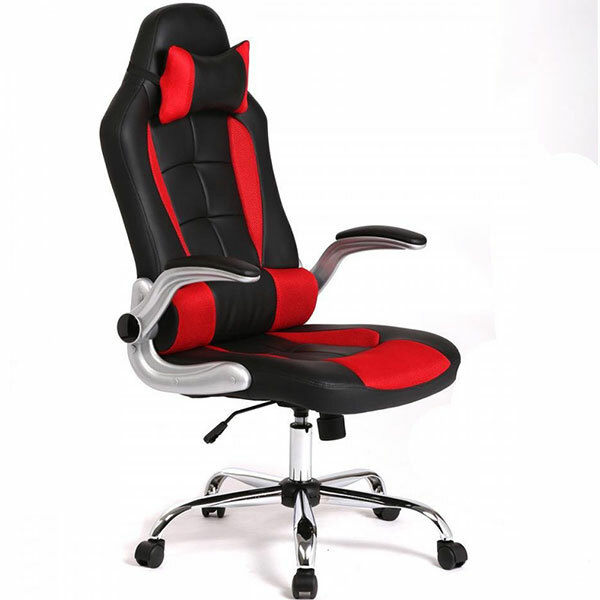 Multi-Function – Besides being a great and comfortable gaming chair, you can also use it in offices as an executive office chair as well as a study chair. Superior Comfort – GTRacing used the finest materials to build a comfortable seat with lumbar support, body-contouring back seat and a headrest. Rocking Mode – You can rock with this chair by setting it in rocking angle and setting the rocking tension with the knob underneath it. Warranty – GTRacing offer a one-year warranty on the purchase of this gaming chair. Center Post – Its center post drags on the floor and may damage it when swiveling. The GTRacing Swivel Rocker E-Sports Gaming Chair boasts a strong and sturdy design reinforced with the best quality materials that give it the weight to stand on the floor firmly without tipping over. GTRacing tested it and gave an assurance that it can support a maximum weight of 330 lbs, something that has been attested to by verified customers in their reviews. It can be adjusted at many angles from 90 – 170 degrees thus giving users the power to do more. You can adjust it to a normal sitting position, rocking position and even at an angle of 170 degrees to stretch your back after a long gaming session. This seat stands on 5 caster wheels that evenly distribute the weight on the floor to reduce the impact on the floor surface, especially on hardwood floors. 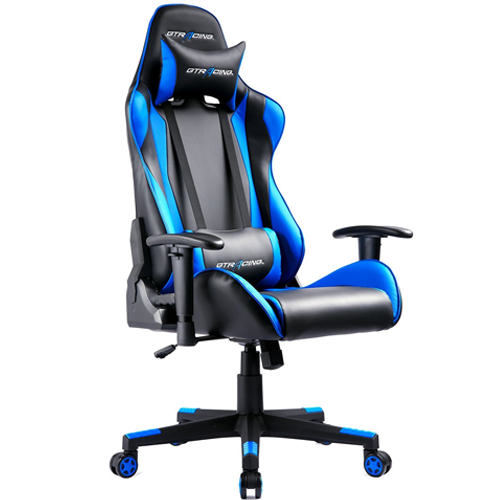 This Merax high-back chair is another great option for those looking for a cheap gaming chair under $100. It sports a stylish and very comfortable design that will relieve you the pressure and fatigue caused by sitting for long hours. If you are a gaming fan or you sit for very long hours in the office, then this gaming chair will be of great help to you. 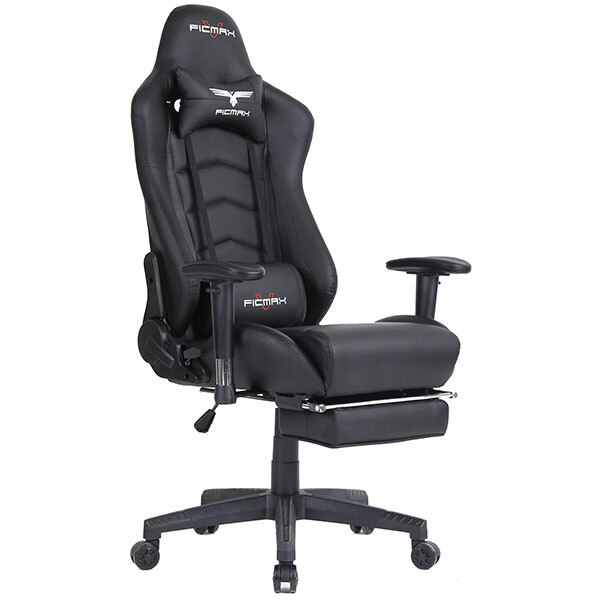 Here is a review of the Merax High-Back Ergonomic Racing Style Gaming Chair. 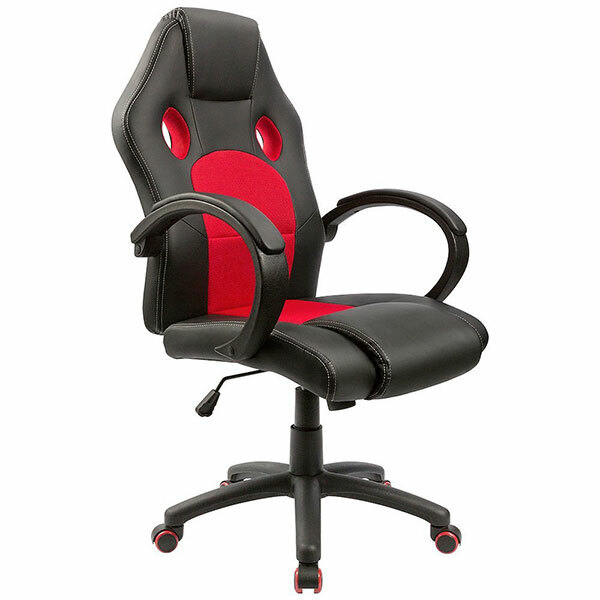 Very Comfortable – The high back, padded armrest and soft-cushion seat make this gaming chair very comfortable. Flexible – Even though it is not a full recliner, you can tilt it to an angle of 120 degrees and even rock it. Wide Application – Even though it has been specially made for gaming, it can also be used in offices or study rooms. Very Affordable – It offers almost the same performance as the top and expensive brands buts cost less. Tilt Lock – There’s a tilt lock lever under the seat that locks it into position to prevent squeaking, improve stability and prevent falls. Easy Assembly – The not so complicated design makes this chair very easy to assemble. Besides, it comes with an instructions manual. Non-Adjustable Armrests – This chair has permanent armrests that can’t be adjusted which may be quite uncomfortable to short people and useless for very tall gamers. Low Weight Limit – Unlike many gaming chairs that have up to 330 lbs. weight limit, the Merax High-Back Ergonomic Racing Style Gaming Chair has a maximum limit of 230 lbs. The Merax High-Back Ergonomic Racing Style Gaming Chair sports a sleek and stylish design inspired by the bucket seats of sports cars. It has been constructed from fairly strong and sturdy materials. However, the 230 lbs. weight limit is very wanting considering the average weight limit for PC gaming chairs is 300 lbs. This gaming chair has no recliner but in its place, you can tilt it to an angle of 120 degrees lockable with the responsive tilt lock lever underneath. The center pole is very strong to support 360 degrees swiveling and also to evenly distribute weight on the five caster wheels. The Merax High-Back Ergonomic Racing Style Gaming Chair has a neatly sewn PU leather cover that is easy to clean and very durable, unlike other cheap gaming chairs. Available in 5 color options, Merax designed this chair with a high-back and ergonomic design to ensure your back and the entire spinal column is accommodated and supported well. There’s also a soft cushion headrest and thick padded armrests which unfortunately are not adjustable. The seating area, on the other hand, is spacious and is made from high-quality cushion for maximum comfort. 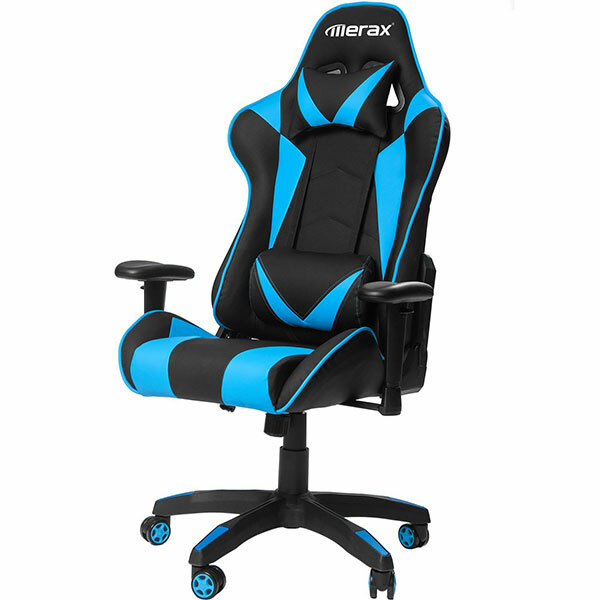 Even though the Merax High-Back Ergonomic Racing Style Gaming Chair has a low weight limit and has no armrest adjustment, it is still a worthy purchase considering it retails at less than $100. It is aesthetically appealing, comfortable, versatile and very durable making it such a worthy investment for gamers. The Coavas High-Back Gaming Chair is another great chair for gaming that you can buy for less than $100. It guarantees the best-in-class gaming comfort even during those long gaming sessions. The Coavas High-Back Gaming Chair is very affordable and doesn’t disappoint at all in terms of comfort and durability. Besides, it is very versatile and multi-functional. Here is a review of the Coavas High-Back Gaming Chair. But before that, let’s look at a few notable advantages and disadvantages. Very Versatile – Even though it is a gaming chair, it can also serve as an executive office chair, desktop chair or even a study chair. Multi-Function – This chair can be used in an upright position, rocking position or even fully reclined for you to stretch your back or take a nap. Very Comfortable – The wide back and padded bucket seat snugly contour around your body supporting the back, spine, neck, and head. Easy Assembly – This gaming chair is very easy to assemble and furthermore, it comes with a detailed instructions manual. Non-Adjustable Arm Rests – Coavas made this chair with permanent armrests which can cause quite a discomfort for short gamers. No Lumbar Support – If you normally tire in the lumbar area, this chair won’t be the best for you. The Coavas High-Back PC Gaming Chair boasts a rather solid structure constructed from a high-quality metal frame. However, it’s 280 lbs. weight limit is a bit low considering there are gaming chairs with even 330 lbs payload. Like earlier said, this gaming chair doesn’t have a recline function. In its place, it features a tilt function with a lock. You can adjust the seat to your preferred angle and even rock it. When rocking, you can also set the preferred tension using the knob underneath it. The 360 degrees swivel and heavy-duty base with caster wheels come in handy when celebrating a kill or relieving tension after those adrenaline-filled encounters. When it comes to look and feel, the Coavas High-Back Gaming Chair boasts a simple and elegant design and is available in 6 color options. It has a neatly sewn PU leather material that is durable and very easy to clean. One major problem with this chair is that it lacks lumbar support which relieves fatigue in the lumbar area. However, the cushions are of high quality but don’t fully cover for the missing lumbar. Coavas also included a pair of stylish armrests but again, on the downside, they are not adjustable. Considering the less than $100 price tag, the Coavas High-Back Gaming Chair is a great gaming chair that any serious gamer should envy. It is comfortable and very durable. Even though it lacks lumbar support, the wide back and comfortable bucket style seat make it a great chair for long gaming sessions as well as long office hours. Another great gaming chair you can buy under $70 is the HomallT-OCR0011 that sports a sleek and stylish design and is available in 4 color options. 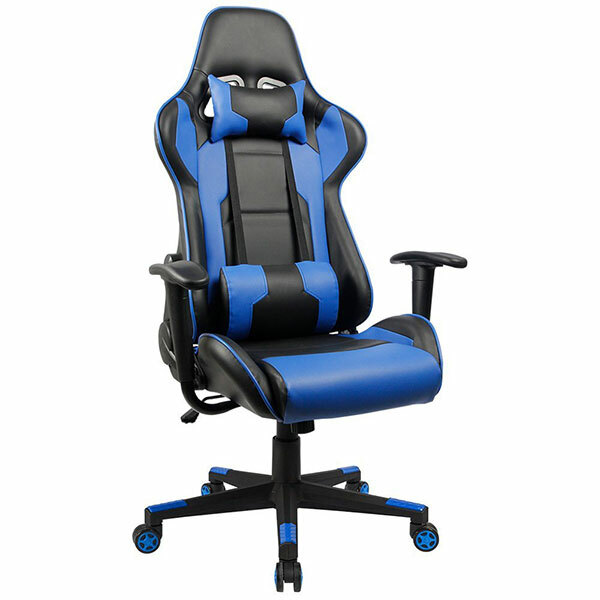 This gaming chair has a wide application as it can be used as a gaming chair, executive office chair as well as a study chair. It featured padded armrests, headrest and lumbar support to give you the right posture during those long gaming sessions. Above all, it makes sitting very comfortable allowing you to fully concentrate on your gaming. Elegant Design – If you look at the design, it is awesome and will add aesthetic value to any game room. Lumbar Support – Homall understands that there’s too much pressure on your lumbar regions so they included lumbar support. Adjustable Armrests – To accommodate all heights comfortably, the armrests are padded and fully adjustable. PU Cater Wheels – The wheels roll nicely leaving no marks or scratches on your floor courtesy of the PU material. Multi-Functional – Besides the upright gaming position, the Homall T-OCRC0011 High-Back Gaming Chair has a rocking function for relaxation, back stretching or taking a nap. Very Affordable – The Homall T-OCRC0011 is very affordable bearing in mind it offers an excellent gaming experience. No Full Reclining – This chair reclines but to some extent only so you won’t achieve a bed position. As is the tradition with Homall, this PC gaming chair boasts a strong and sturdy frame and base to support the 280 lbs. weight limit. It has a strong center pole and five multidirectional caster wheels. One great thing about these wheels is that they are crafted from high-grade PU material. It allows these wheels to roll smoothly leaving no marks or scratches on your floors. With a 360 degrees swivel, this gaming chair has a responsive pneumatic height adjustment. It also comes with a rocking function to help you stretch your back or even take a nap. When it comes to comfort, the Homall T-OCRC0011 Ergonomic Chair boasts a high-back design to fully support the weight of your back and the entire spinal column. On the other hand, the seat cushion is much bigger making it much comfortable that your ordinary gaming chair. Perhaps the best thing about this chair is the lumbar support that works by relieving pressure and fatigue on the lumbar area especially during those intense gaming moments. The armrests are padded for maximum comfort and fully adjustable to cater for all height groups. If you are looking for a standard gaming chair on a budget, then you need the Homall T-OCRC0011 High-Back Executive Racing Style Swivel Gaming Chair. It is comfortable, durable and very friendly on the floor surface. Above all, it comes at an affordable price so everyone can now own a pro gaming chair! If you are looking for budget gaming chair, then this is your best deal. 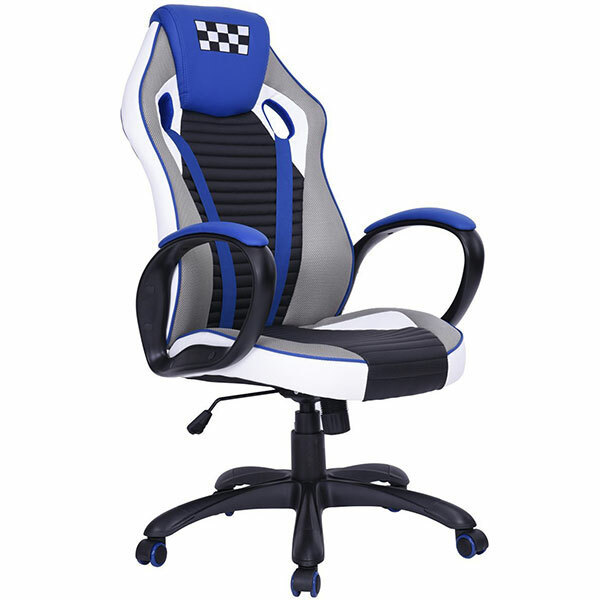 Although it is also suitable for offices, this racing style chair is great for gaming. In fact, the bucket-style seats give users an almost virtual experience on a driving seat when playing racing games. This chair can recline up to 180 degrees and has a payload limit of 250 lbs. Here is a review of the BestOffice High-Back Recliner Office and Gaming Chair. Here are its advantages and disadvantages. Elegant Design – This seat has an appealing design and is covered with a nicely stitched synthetic material. High-Back Design – The high-back design contours the back cushioning your spine and maintaining a healthy posture. Footrest – The BestOffice High-Back Recliner Office & Gaming Chair is among the few gaming chairs that come with a footrest. Great Traction – Its weight and wheels give it good traction on floors and distributes weight evenly to avoid floor damage. Adjustable neck and lumbar pillows – For your comfort, you can adjust the neck and lumbar pillows to a position that suits you best. Affordable Price – The $100 price tag is very pocket-friendly considering this is a top of the range gaming chair. Non-Adjustable Armrests – This gaming chair has non-adjustable armrests which make the chair uncomfortable for short and very tall gamers. Low Payload – The 250 lbs weight load limit is too low and limits some heavy gamers. The BestOffice High-Back Recliner Office and Gaming Chair sports an elegant and very simple design crafted using strong materials for durability and most importantly, to give it support. However, the 250 lbs payload is not very impressive considering the average weight limit for gaming chairs is 300 lbs. This chair has a full recline and can be adjusted at any angle between 90 degrees and 180 degrees. This makes it a great chair for all day gaming as well as a napping bed for stretching your back. Height adjustment is very easy courtesy of the gas spring adjustment that is very responsive. The center pole is strong and has a 360-degrees swivel and 5 caster wheels which have a great grip on linoleum and laminate floor surfaces. One unique addition to this gaming chair is a footrest that can come in handy when relaxing especially when stretching your back. The 36-inch high back is spacious enough to fully comfort your back and spine. It has been specially designed to contour on your back and snugly fit your entire back. The sitting area has a bucket design and has been padded for maximum comfort even when gaming for long hours. Even though the armrests are spacious and well padded, they are not adjustable; a major setback especially for short gamers. The BestOffice High-Back Recliner Office and Gaming Chair is a great chair that should top the wish list of any gamer looking for a comfortable and versatile gaming chair under $100. However, make sure that you are neither too tall nor very short and you weigh less than 250 lbs before buying it. For those looking for a sophisticated gaming chair with a massager that retails under $200, then the Ficmax Ergonomic High-Back Gaming Chair with Lumbar Massage. Besides gaming, it can also double up as an office chair, study chair as well as a resting bed courtesy of the 180 degrees tilt angle. Its comfort, lumbar massage, and retractable footrest really make this gaming chair exceptional. Here is a review of the Ficmax Ergonomic High-Back Gaming Chair. Unrivalled Comfort – The large seat cushion makes sitting for long hours very comfortable. Footrest – There’s also a retractable footrest that helps keep your feet in a comfortable position. Adjustable Armrests – The armrests are spacious, padded and most importantly, adjustable upwards and downwards. Wide Chair Back – To allow maximum back support and comfort, Ficmax included a wide and tall back. Responsive Height Adjustment – The explosion-proof gas spring makes height adjustment very easy and safe. Wobbly Armrests – These armrests are not sturdy enough. When you put a little more pressure the chair swivels around. This gaming chair, just like many gaming chairs out there has a load limit of 300 lbs. courtesy of the strong and sturdy design and high-grade frame materials. It also has been built to allow 90 – 180 degrees recline. This feature allows you to find your perfect spot; whether an upright position for full focus or 180 degrees for resting and stretching. Furthermore, to help you relax and to improve blood circulation, there is a retractable footrest. To give it the stability it deserves, Ficmax incorporated a heavy-duty base with caster wheels. This gaming chair has a 360 degrees swivel and a gas spring height adjustment. To make it look appealing in any game room or office, Ficmax covered it with neatly sewn PU leather. This chair is available in 5 different colors to suit different color preferences. There is also a pair of wide, padded and adjustable armrests that can be pulled up or down depending on gamers’ height. The seating area is wide and has been crafted with a high-quality cushion that contours the player’s body shape and doesn’t deform easily. Perhaps the best thing about this chair is the adjustable lumbar that comes with massage function to relieve fatigue using vibrations. The headrest is also adjustable and fully supports the neck area and head. The Ficmax Ergonomic High-Back Gaming Chair with Lumbar Massage is a great choice for those looking for a superior gaming chair under $200. Its comfort, lumbar massage, and footrest make it the best gaming chair under $200. If you are on a budget and you want a gaming chair with best-in-class features, then this is your perfect match! If you are looking for something more robust and ergonomic, then this professional gaming chair from Merax is a great choice. 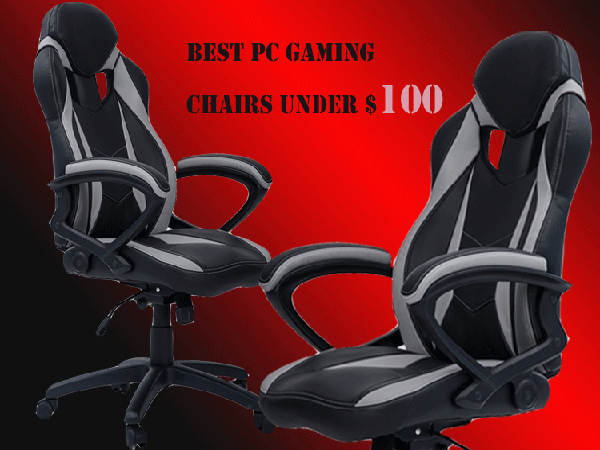 It is among the best gaming chairs under $200 and comes with a range of top class features. Even though it has a low weight limit, it comes with several unique features that make it a cut above the rest. It offers unsurpassed ergonomics and is perfect for all day gaming. Besides gaming, it can serve as a great office chair and is very multi-functional. Here is a review of the Merax Ergonomic Racing Style Gaming Chair. Versatile – This gaming chair has a lot of applications besides gaming. You can have it in your office or even study room. Multifunctional – You can set this gaming chair in an upright position for gaming, tilt it when relaxing and recline it at 180 degrees to stretch your back or take a nap. Wide Adjustable Armrests – The armrests are very wide, padded and fully adjustable to make gaming comfortable for both short and tall gamers. Racing Design – At first glance, you will notice the striking design that totally looks like a real sports car seat. Heavy Duty Casters – The wheels have been made from high-quality material for easy movement without squeaking. 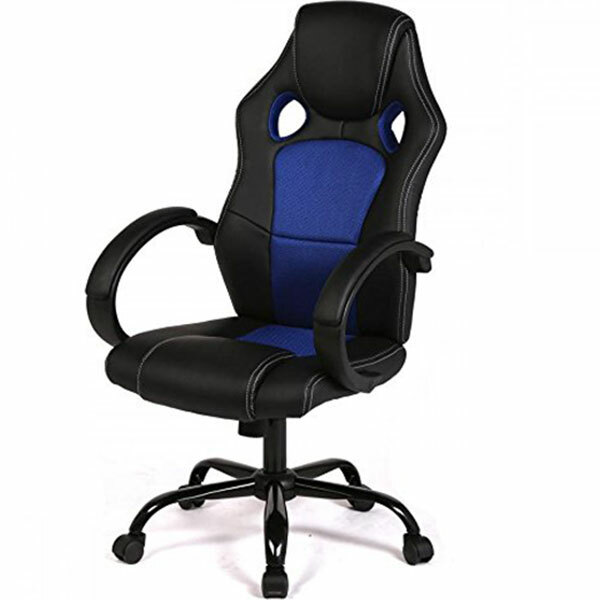 Lumbar Support – This gaming chair comes with a lumbar support to soothe you where you feel fatigued. Head Rest Pillow – Merax included a headrest pillow to help you maintain a stable neck and head position when tired. Low Weight Limit – For an almost $200 PC gaming chair, 300 lbs would be best and not the supported 250 lbs. weight limit. Merax is among the brands best known for great aesthetics and they never disappointed with this chair. The Merax PC Gaming Chair boasts a striking design that resembles a real-life racing car seat. It is recommended for those weighing 250 lbs. and below. Unfortunately, this does not meet our expectations because we think that for a $200 gaming chair, it should be nothing short of 300 lbs. One thing we liked about this Merax gaming chair is its multi-functionality. It has a recline system that allows the seat to be tilted at different angles from 90 – 180 degrees. Regardless of your weight, the heavy duty 3-inch pneumatic height adjuster is very easy to use courtesy of the high responsiveness. The base is a 5-stand with heavy duty and multidirectional caster wheels on a strong center pole with 360 degrees swivel. When it comes to aesthetics, the Merax PP033082CAA boasts high-quality PU leather upholstery available in 3 color options; blue, green and red.. 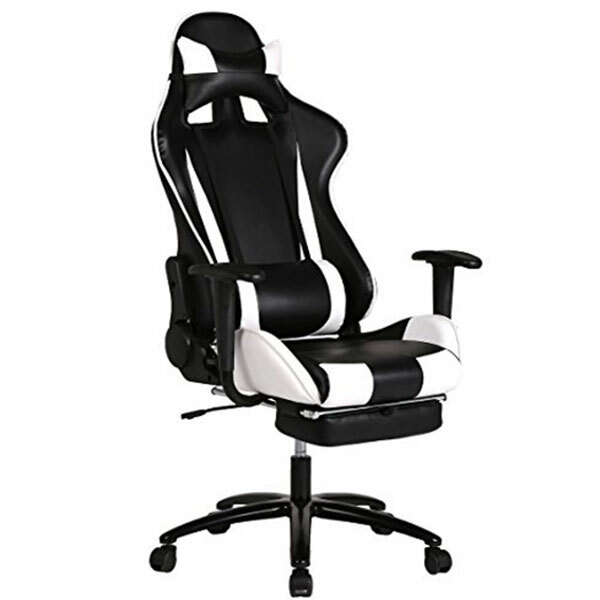 The high-back design gives gamers full back support and supports the spinal column. To give you the comfort you need so as to fully focus on gaming, Merax has thick, padded cushions for extra comfort. The adjustable armrests are well padded with a high-quality material that doesn’t wear off easily. This gaming chair also has lumbar support and a unique headrest pillow for your neck and head. If you are looking for the best gaming chair under $200, then the Merax PP033082CAA Racing Style Gaming Chair will be a great buy. It is affordable and offers great comfort for a remarkable gaming experience! Bucket Style – This chair has a bucket design to enhance the comfort of gamers during those long gaming sessions. Spacious Back – To fully accommodate and support your back and spine, the back area is spacious and has been crafted from a highly elastic material. Highly Versatile – Besides using it for gaming, you can also have it in your office or study room. Pneumatic Height Adjustment – This chair has a gas spring height adjustment that is very responsive and gentle. Very Affordable – This gaming chair has some of the best features and costs around $90 which is very affordable for such a versatile gaming chair. Lacks Recliner – Unlike many of the gaming chairs we know, this particular one doesn’t have the recliner function. Low Weight Limit – The 250 lbs. weight limit is very low considering many similar chairs support 300 lbs. The BestOffice New High-Back Gaming Chair has a rather strong base to allow it support the 250 lbs. weight limit. One problem with this chair is that it has no recliner like many gaming chairs we know of. BestOffice included a stable base, 360 degrees swivel and a pneumatic height adjustment that is very responsive even on slight touch. It can slide up or down slowly unlike many chairs that jerk suddenly, something that can seriously injure your back. This seat has a simple and elegant design and is available in 3 color options; red, blue and white. Its upholstery is crafted from high-quality PU leather and mesh that is neatly sewn and is easy to clean. The back is wide and spacious to fully accommodate the entire back and spinal column. Even though the headrest is combined with the back area, there is a neck pillow provided to give your neck, head, and spine stable support for maximum comfort. There are also armrests that are easily adjustable and can be moved up and down. Even though it may be looked down upon because of its cheap price, the BestOffice New High-Back Gaming Chair offers great comfort when gaming for long hours. With a price tag of around $90, this is the ultimate gaming chair that amateur gaming enthusiasts should at least dream of having. 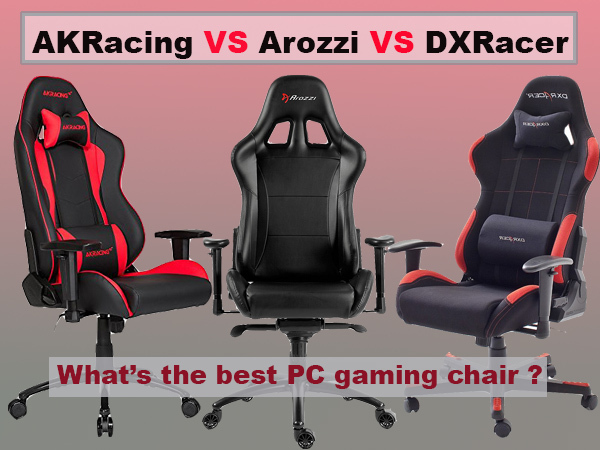 Now that you know about the best gaming chairs, it’s time we help you decide on the best PC gaming chair that will suit your needs and most importantly budget. For us, we will not settle on one product, that’s up to you. We will only help you make the best decision that will give you value for money. 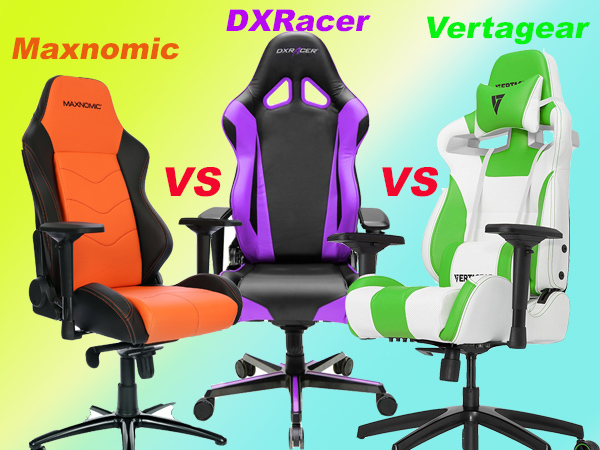 In this segment, we are going to discuss the factors that you should carefully consider when shopping for the best gaming chairs in the market but before that, we will look at reasons why a gaming chair is a worthy investment. Do I really need a PC Gaming Chair? Like earlier mentioned, most gamers only focus on the best gaming consoles and forget that their comfort counts in the overall gaming experience. You may be a badass in FIFA but without a comfortable sitting posture, your game will fade as time goes by because of the discomfort. With this in mind, if you want the perfect gaming experience, you will need to invest in a gaming chair. Not just any other gaming chair, the best gaming chairs. So, without further ado, here are a few advantages of investing in a gaming chair. First, a good gaming chair is very comfortable and will give you a good gameplay. There are many good gamers out there but they don’t know that the discomfort from bad sitting postures greatly distract them. With an ordinary chair, time and again you will be busy trying to make yourself comfortable. This will steal your focus on the game and consequently, your output will be lower. However, with a good gaming chair, all your attention will be in the game. PC Gaming chairs also have several health benefits. Research shows that bad sitting posture when sitting for long hours is detrimental to your general well being. Most gamers who use just any chair will likely sit in a bad posture. This is why you should invest in a good PC gaming chair. A PC gaming chair will improve your posture, allow blood flow to your legs, improve your spine health and so on. Now that you know the essence of owning the best gaming chairs, it’s time we guide you on how to select the best gaming chairs. When shopping for the best gaming chairs, there are several factors that you need to consider before paying for any PC gaming machine. These factors are majorly based on the chair’s features and performance even though other factors like price come into play too. To make things easier for you, we have discussed the main factors that you should carefully inspect in your next PC gaming chair. The primary importance of gaming chairs is for ergonomics. In this context, ergonomics is all about how the gaming chair will improve your sitting posture. Gaming chairs come equipped with several features to improve ergonomics. These include height control, armrest adjustment, tension control, recliner, tilting, backrest lock, and so on. Even though not all gaming chairs will have all these features, the best gaming chair has most of these features to enhance ergonomics. PC Gaming chairs come with a tried and tested weight load limit. Even though most people fall in the set range, it is always important to make sure that the gaming chair you are buying can support your weight. Most gaming chairs in the market today average 300 lbs. Even though there are some standard features that a gaming chair ought to have, several newer models come with extras. These extras include lumbar support, headrests, massage and so on. It is, however, important to note that these features come at an extra cost. If you are not on a budget, go for a gaming chair with the most extras for a revolutionary and remarkable gaming experience. Most gaming chairs will come when disassembled. You will have to read the manual and assemble the components correctly. Assembly has to be done keenly and professionally because if you miss a point, you won’t have a complete gaming chair. Different gaming chairs have different assembly procedures depending on their parts and components. It is recommended that you go for a gaming chair with easy assembly. Two things are important here and should be noted. The more a gaming chair is sophisticated, the harder it’s assembly. However, this is not always the case. Second, always make sure that you buy a gaming chair with its manual included. Even though in gaming the basic equipment like consoles and gamepads are considered the most important, comfort is also a determinant of the entire gaming experience. When you are comfortable, you focus more on the game because you have no distractions at all.For the best comfort, a PC gaming chair will do the magic. So, if you want to be a better player, buy a gaming chair today and feel the difference. If you were not sure of which one to buy, you now know the deals!